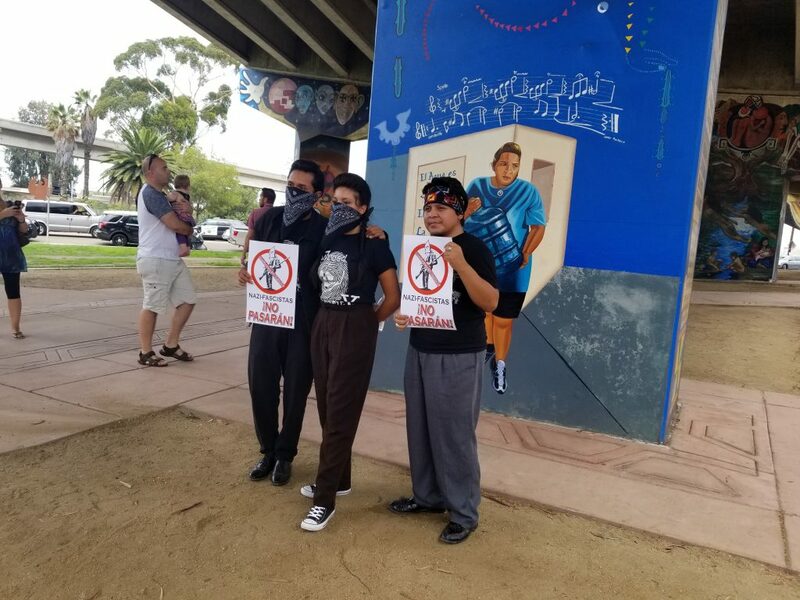 Word of mouth spread quickly that a group of white supremacists planned to defaced the murals at Chicano Park because they were frantic that their Confederate statues were threatened to be removed throughout the U.S., and this was their proper recourse of action. The nationalist caused chaos in Charlottesville, Virginia causing a riot, killing a lady, and injuring other people of color who resisted injustice. The neo-Nazis attempted to create the same absurdity in Logan Heights, mi barrio. The summer of 2012, Nayeli, Monse, and I painted a mural as part of the Chicano Park restoration project. 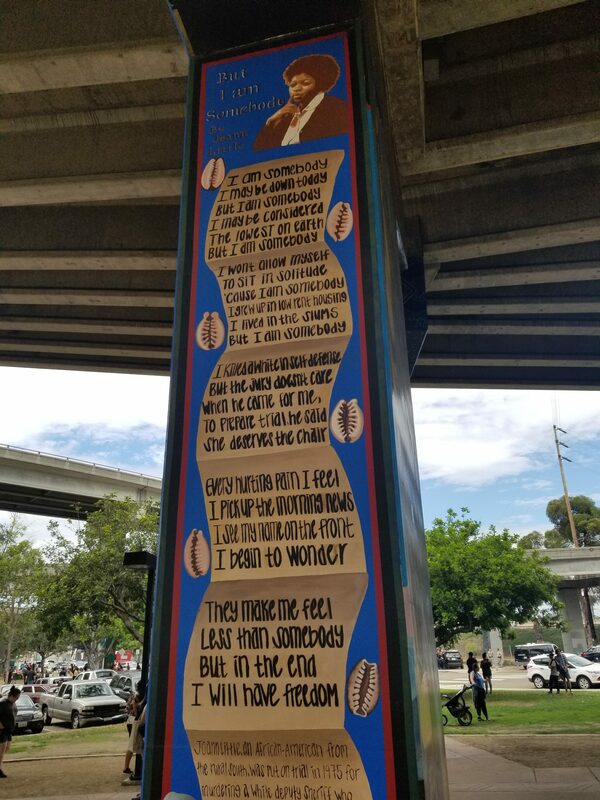 We participated with the older women, who were the original muralists back when the city of San Diego scheduled to build a police station on our land. On April 22nd, 1970, the community of Logan Heights united to fight for a park, digging holes to plant trees, blocking bulldozers, and forming human chains. My uncles and father were protesters, a responsibility of activism they now passed on to me. The day the white supremacist strategized to eradicate the park they, too, were met with the same people, as well as the newer generation who raised against oppression. Nayeli, born in Michoacán and majoring as an engineer at UCSD, wore her custom-made indigenous jewelry; Monse, born in Mexico City and served in the U.S. Navy, wore her Mexican embroidered blouse; and me, la pocha, wore a t-shirt that read Desde La Logan in old English lettering, each with our own unique barrio style. We met at Salud, a new tacos spot that used to be the old Porkyland, and then we walked a few blocks to our destination. Most of the local businesses were replaced with businesses that generated more revenue geared towards modernization. The only thing that still remained authentic was Chicano Park. 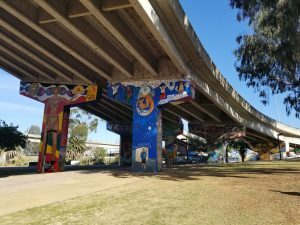 Police officers were in full force, and the Chicano Park Steering Committee wrote a letter as a reminder to stand in solidarity and not display any form of violent acts. Over 500 people came together to protect the murals, forming a circle around each one. A native man blew on his ocean shell that warned us the group had arrived. We quickly took our stance, fist in the air, like an army ready for battle. 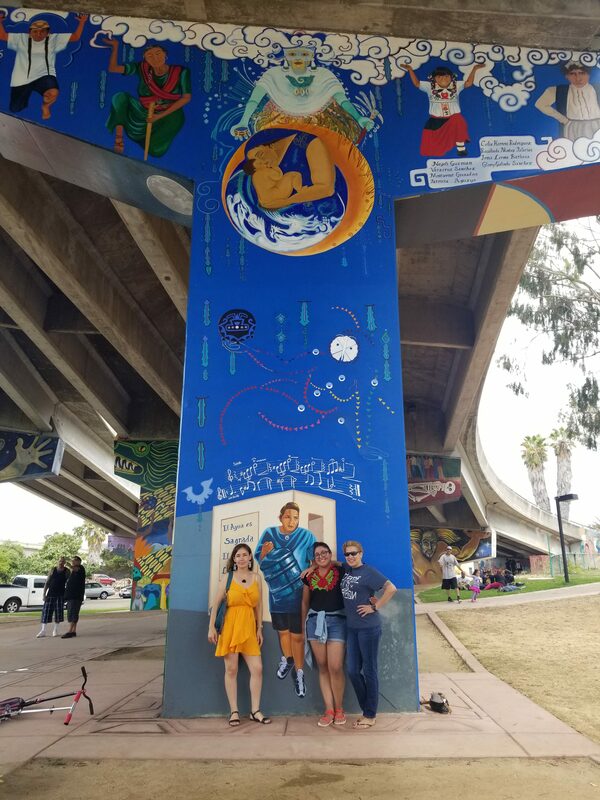 Nayeli, Monse, and I guarded our mural, Women Hold up Half the Sky, along with a group of Pachucos who traveled from Los Angeles to support the cause. There were different forms of Mexicans: the Pachucos, the rastas with dreads, the Zapatistas, the bikers, the homies in lowriders, the natives, and the Brown Berets. Flags from Latin American countries soared high. The group was confronted by power and resistance. On September 3rd, 2017, racism did not win. The blue line shield the nationalist for protection and eventually escorted them off the premises, the crowd cheering in victory as they left. My uncles’ song playing from the quiosco, “We shall continue to live my brother. We shall continue to fight my friend. For Chicano Park. Under the bridge.” The day we stood up to white supremacists, Trump put a halt to DACA recipients, and I realized the fight wasn’t over. Nayeli was in the process of becoming a citizen through DACA. Her son was a US citizen, and I was torn that if she was removed from the only country she knew, where would her son go? Walking back to my car after the event settled down, I had parked across the street from my old bus stop, which was in front of a two- story white house, the same bus stop where I waited each morning. Since the house I grew up in was only a block away, I cruised down memory lane. The house on Julian Ave was no longer brown and yellow but blue with an American flag and Rottweiler guarding the property. An old man slowly approached the screen door when he noticed me loitering outside his property. “Yes. She’s my mother.” I explained that I was at the park for the protest and decided to come revisit my old house since I was in the neighborhood. I asked about childhood friends. They all moved out of Logan and up north starting their families, working their typical 9-5 jobs. Jaime was working for the city, and his brother, Chonie, was a deputy. Their mother, my nina, moved to Murrieta. The house, for the most part, was what I remembered, the porch paint still chipped, paradise flowers in the yard, an apricot tree, and the driveway where I dribble my basketball. I pondered about growing up in Logan Heights over the years. Some good, some bad. Although the neighborhood was different in some aspects, the people were still willing to protect their land even if they moved miles away. As I stood outside my old house on Julian Ave, I was reminded that the little girl in me, once lost, found her way back home.